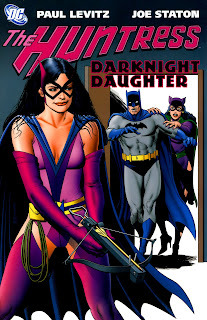 Helena Wayne Huntress: I Can't Buy Huntress: Dark Knight Daughter In Print. How Do I Buy It Digitally? Personally, I still think the Bronze Age is the character's true Golden Age. However, I am also aware that many of the trades that reprinted those stories in the last decade aren't still in circulation, at least not in print. At this point, you can only buy them from other sellers, and they don't exactly sell trades like Huntress: Dark Knight Daughter for cheap cause they know the value of the character (especially now). The majority of Helena's Bronze Age stories, however, are available for digital purchase either as individual issues or the trades themselves. For my first post of 2018, I will provide the Comixology links to her stories reprinted in the Huntress: Dark Knight Daughter trade in the same order as the trade. Unfortunately, unlike her Justice League and Justice Society appearances, not all of her solo stories are available yet for digital purchase. However, when they do become available, those chapters will be updated with Comixology links. Fortunately, 10 out of 25 of those solo stories collected in the trade are available now and at reasonable prices ranging from $0.99 to $1.99, so it's a start. At least Helena's Bronze Age origin story is available now, and that is her most important story in the trade. Having said all this, let's get started! Of course, I do still recommend buying the Huntress: Dark Knight Daughter trade if you happen to get lucky and find it for a good price. Trust me, it's worth it! And, of course, don't forget to check out my list of pre-Crisis Huntress comics you can buy on Comixology for the rest of her Bronze Age stories!